Romance is in the tropical air. Okay, it’s freezing pretty much everywhere but not on Joy Island in the Bahamas. The weather is perfect. Feel the sun on your skin, the smell of coconut and fruit filling your senses, and love falling at your feet…possibly tripping you up! I am super excited to be a part of a fabulous new romantic series that begins releasing next Tuesday, February 19th! But you can preorder the ENTIRE series right now and save $20!!! The Resort to Romance Series is unique for sure. And you are SURE to love it! WHAT IS RESORT TO ROMANCE ALL ABOUT? Ten delightful – and standalone – novellas linked by one matchmaking week. You’ll want to devour each one! Jill Kemerer kicks off with her release A Meddled Match. And then my book, A Messed-Up Match releases February 26th. A Kindergarten teacher with fears to overcome. An infamous blogger and magazine writer with a cynical view. And one romantic week that will bring second chances. Neeley Valentine has spent nearly all of her savings to participate in a matchmaking week on Joy Island in the Bahamas. But she’s not looking for a love connection so much as someone who will force her out of her comfort zone. Pax Cannon is known to the online world as the Love Curmudgeon, and he’s ready to prove in one of his biggest articles yet that matchmaking weeks are a joke and men should run as fast they can from them. When one of the resort’s rules is broken, bringing these two together, neither are prepared for the unexpected twists and turns that will school them on the subject of love. Join us next week as we kick off these releases with a HUGE, like HUUUUUGE giveaway to celebrate! 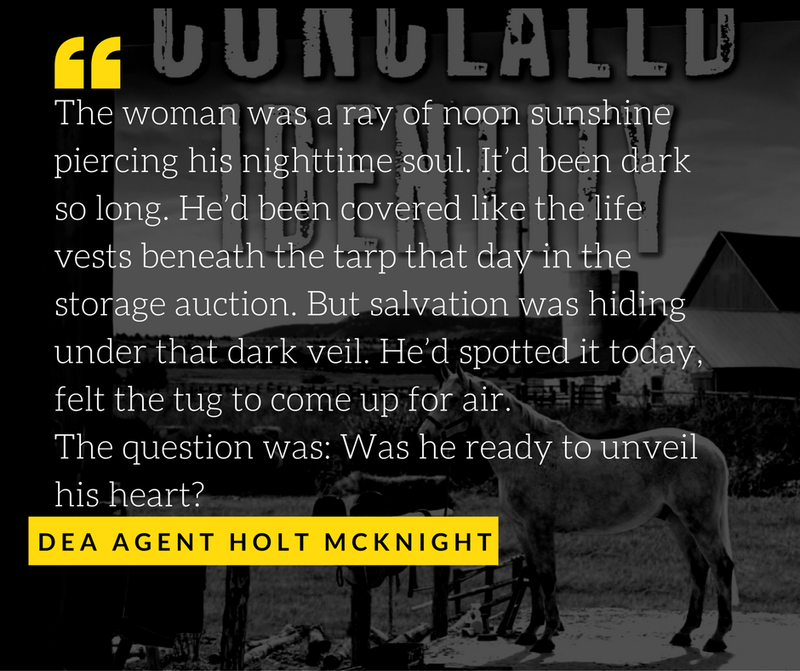 You can preorder these 10 novellas at just .99 cents a piece now. 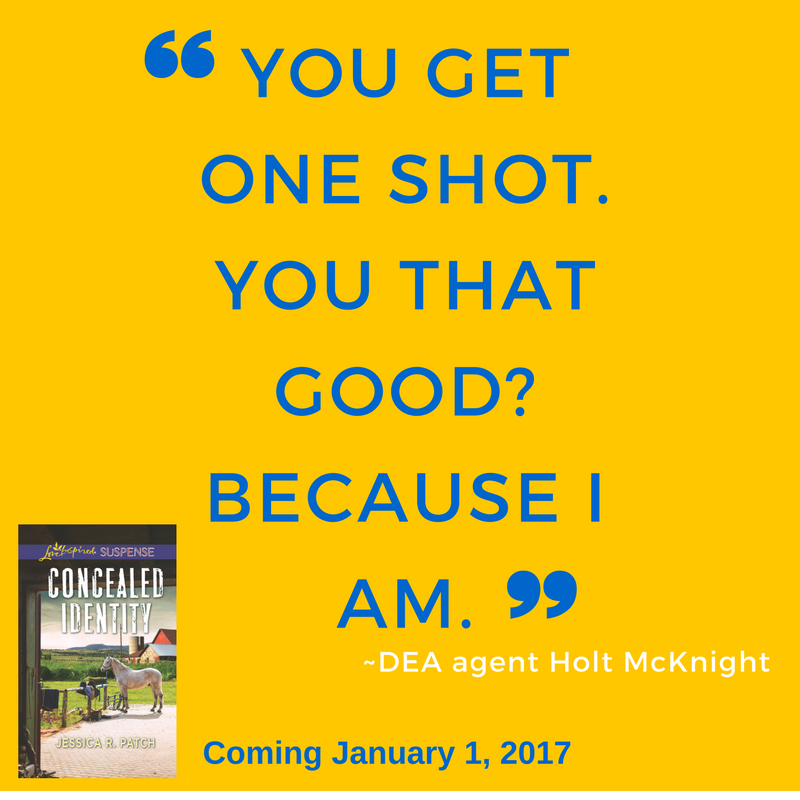 The price goes up each book after the individual release week! 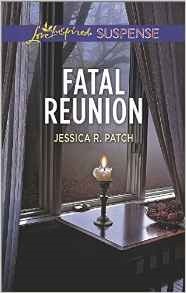 Posted in all about fiction, books, fiction, romance, UncategorizedTagged A Messed-Up Match, beach read, jessica r patch, Resort to Romance, romance, sweet romanceLeave a Comment on Welcome to a Brand New Series! All About Valentine’s Day and Romance with Carrie Schmidt! Can I just say how super-sweet it is to have Carrie Schmidt (you may know her through Reading is My Superpower blog and Facebook page). Let me tell you a little about this precious lady. 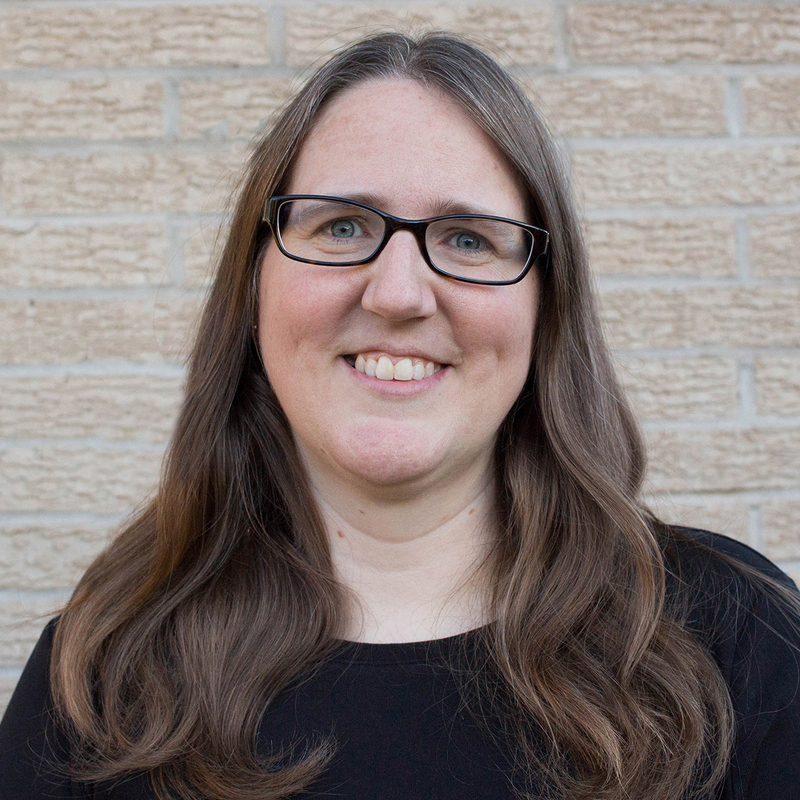 Carrie is an avid reader, book reviewer, story addict, KissingBooks fan, book boyfriend collector, and cool aunt. She also loves Jesus and THE Story a whole lot. 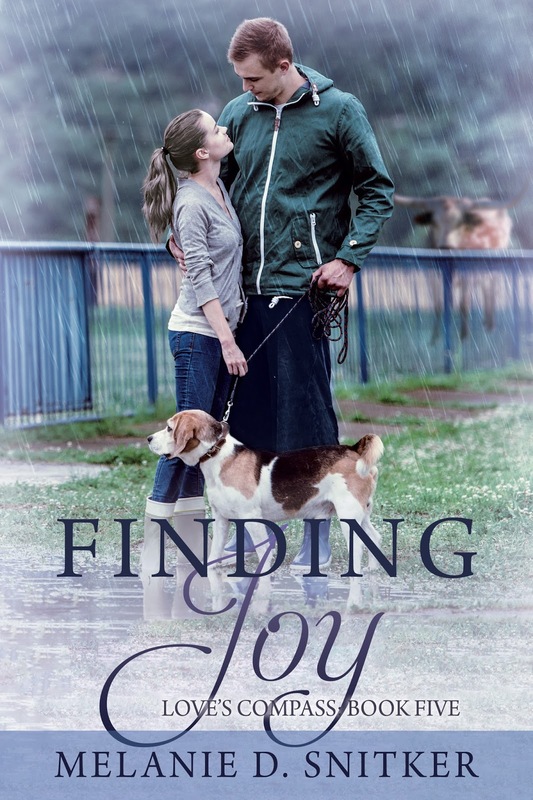 A reviewer for RT Book Reviews and a co-founder of the Christian Fiction Readers’ Retreat, Carrie lives in Kentucky with her husband Eric and their quirky dog Zuzu. She can be found lurking at various blogs and websites (because she can’t stop talking about books) but her main home is the blog she started in 2015 – ReadingIsMySuperPower.org. She’s been super precious to me and I’m glad she’s here. Waving at you, Carrie! I asked her some questions about romance, Valentine’s Day, and of course books. You’re going to love her answers and guess what? She’s giving away a Romance Trope and Book Boyfriend candle to 2 lucky winners! (U.S. Only, the entry form will be below. So, let’s talk romance, books, and Valentine’s Day. How old were you when you were drawn into the romance genre? What book hooked you? What was it about that book that caused you to fall in love with the romance genre? I have always loved romance – from the moment I first watched Prince Charming dance with Cinderella. But Love Comes Softly showed me that fictional romance could go beyond Disney’s definition, that it could include real life & history & friendships. And that, in the process of telling me a great story about two people who fall in love, it could also help me fall in love with God a little more too. Why do you think women love to read romance? Is this why you love romance? If not, tell us what it is you love about this genre? I really think women love to read romance because it’s part of that ‘eternity’ that God has placed in our hearts (Ecclesiastes 3:11). We crave these romance reads where some form of Prince Charming comes riding in on some form of a white horse, rescues us (I mean…the heroine), and we (I mean…they) lived happily ever after… because it’s the story God’s been telling from the beginning! We are the Bride of Christ & one day Jesus will come riding in on a literal white horse (see Revelation 19) and rescue us for the ultimate happily ever after (Revelation 21). So I think it’s just part of our soul’s DNA and, because we’re still waiting for it to play out in reality, we gobble up these little reflections of it in the meantime. And all that to say (lol) – that’s what I love about reading romance! It reminds me that I’m living in an even greater Story with an even better HEA that one day will actually come true. And… you know… the hot heroes and swoony kisses don’t hurt either. Oh my word! I agree too. It’s why I love to write it. I have to share that Divine Romance with readers!! Love this so much. And uh, no they don’t! I adored Charlie Lionheart and Ty Porter. I also need to step up my game and read and these other books! Do you have a favorite romance sub genre? Why is it your favorite? I love romantic suspense. Because as long as I’ve loved romance, I’ve also loved mysteries. Nancy Drew is my home girl. (Do people say that anymore? Lol) But my favorite Nancy Drew stories were the ones when she teamed up with the Hardy Boys because, let’s face it, Frank Hardy made a better book boyfriend than Ned Nickerson. (sorry Ned) Getting to read a romantic suspense ties both of these loves together for me, plus the tension created from the suspense adds to the romantical tension which is another win-win. Yes! I mean how can this rom/suspense writer who always throws in mystery not love that answer. 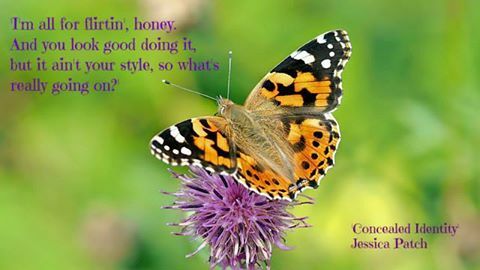 Have you ever thought about writing your own romance novel? Why or why not? Thought about it? Yes. Will I ever actually write one? Probably not. Mainly because a) I don’t think I have that specific kind of talent and b) it would cut into my reading time too much lol. What is one romance novel that has stuck with you over many years? Why do you think that is? Okay, I gotta read this book! Wow! Do you celebrate Valentine’s Day? Some people don’t want to be told to do something special on one day but feel romance and kind gestures should be done all throughout the year, which I agree, but I love Valentine’s Day. Might be because it’s the anniversary of the first date with my husband (24 years ago!) What’s your take on this day? Ok, now you’re really making me think!! LOL. Honestly?!? I know that there are some, but I haven’t read many. I’m not sure why. Totally seems like my thing. I definitely recommend Paper Hearts by Courtney Walsh and The Cupcake Dilemma by Jennifer Rodewald. Other books that people have recommended to me (but I haven’t read yet) are Once Upon a Winter’s Heart by Melody Carlson, Secretly Yours by Valerie Comer and Operation Valentine by Elizabeth Maddrey. If your special someone gave you a gift for Valentine’s Day that was solely focused on a book/reading them, what would that gift (day or weekend!) look like? Ooooo what a fun question! I have always loved the idea of this bookstore date from The Dating Divas! And I really really want one of these adorable custom bookish blankets from Sweet Sequels on Etsy! I love the Dating Divas site! I just printed some stuff from there for this lovely week! I’m spoiling my man because he ALWAYS spoils me! Thank you so much for being here today, Carrie! It’s been fun. Readers and writers, you can also connect with Carrie on Facebook @ meezcarriereads and everywhere else social at @meezcarrie. Enter for a chance to win 1 of 2 Novelly Yours candles! 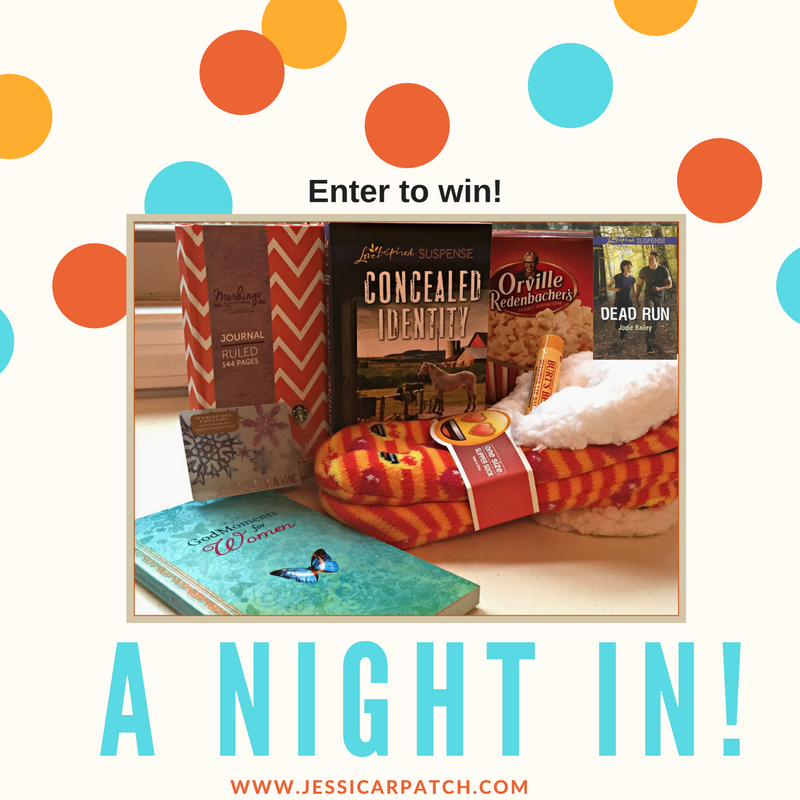 Posted in all about fiction, giveaways, guest postsTagged @meezcarrie, book boyfriends, books, candles, Carrie Schmidt, giveaway, jessica r patch, novels, reading is my superpower, romance, Valentine's Day7 Comments on All About Valentine’s Day and Romance with Carrie Schmidt! I admit, I’m a terrible swimmer. I still hold my nose and if shoved under, I will surface choking and coughing. I might be able to save my life and I’d hope one of my kids if necessary, but anyone my size or bigger…you’re just not gonna make it. The shallow end was my preferred territory as a kid. While my siblings jumped off docks and into deep water, I was content to sit near the shore and play in the sand. Okay, that’s a lie. I wasn’t content. I pretended to be content. In the marrow of my bones, I longed to run and jump off the dock and into deep waters. I dreamed of diving off the diving board with friends at camp. Instead, I lied (yes at church camp, clearly I needed it) and said I wasn’t following the herd. I talked people out of diving off the diving board with some of my words. I held others back from the deep waters…because I was too afraid to take the plunge. In my relationship with Jesus, I’ve played too many years in the shallow end and watched too many friends enjoy the deep waters. The deep waters are a place where you can’t see beneath you. Can’t touch. Can’t see land. Without markers, how will you find your way back to shore? Deep waters contain vicious beast that want to devour you like sharks, jelly fish–okay not devour but definitely sting–among many other freaky creatures. But Jesus call us to deep places. It’s in the deep places, if we’re obedient, we find our truest calling and passion. It’s where our lives become a testimony. Where we can walk over waves. Where we drown in grace and are buoyed by faith. Simon Peter didn’t want to go out into the deep. But because he did, they hauled a major load of fish. So much the boat nearly sank. NEARLY. It was in the deep waters where Peter walked with Jesus. Fear is a hindrance from launching into the deep. Fear of failure. Fear of success. Fear of uncertainty. Fear of (fill in the blank). In my new release, Deep Waters, my heroine is terrified to trust God due to past hurt and failure. She’s watched too many people suffer and refuses to suffer too. Maybe you can relate to Caley. It’s easy to say we trust God in the shallow waters where our feet touch and we’re delusional enough to believe we have full control of our lives, our situations, and our circumstances. Question: Is there an area in your life that God is calling you into deep waters? Would you be bold enough to share it? I’ll be praying for you. I’m giving away a copy of Deep Waters. Paperback for U.S. citizens and e-book for those of you abroad! 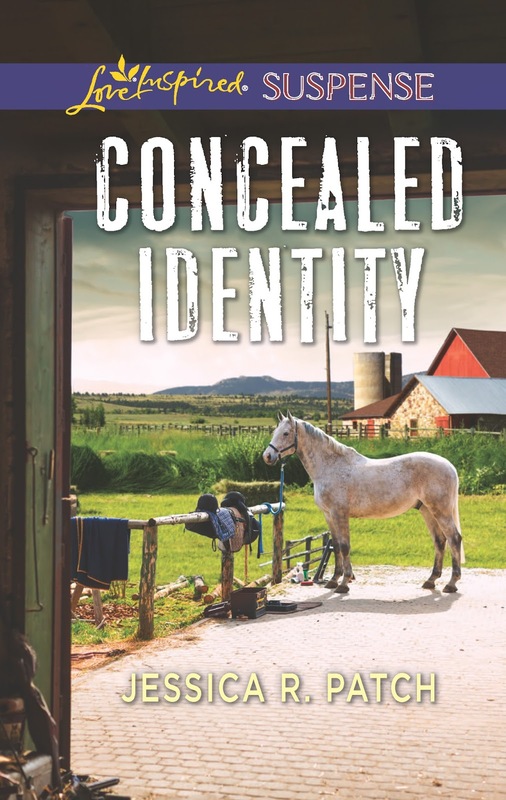 10 copies of Concealed Identity! I am so excited to be a part of the 12 Days of Christmas! Just look at the graphic to see how amazing it is! 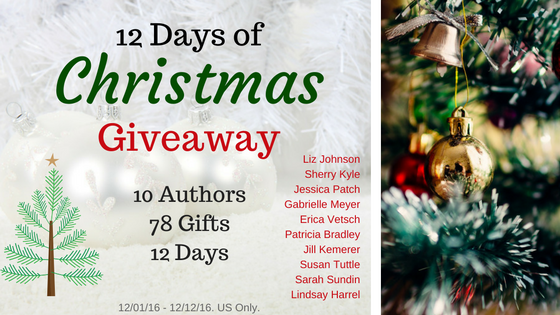 Each day a new author will be giving away a fun prize (books included) and YOU could win! All you have to do is enter the giveaway below! My newest book has some Christmas elements in it. For example, my heroine, Blair Sullivan is obsessed with Christmas (she has reasons) and that’s why she’s named her antique store It’s a Wonderful Life. She even has a bell above the door so an angel can get its wings (like, she knows this isn’t real, it’s nostalgia) and her sweet little shop that’s set in the quaint and quirky small town of Hope, TN is decorated like Christmas 24/7. 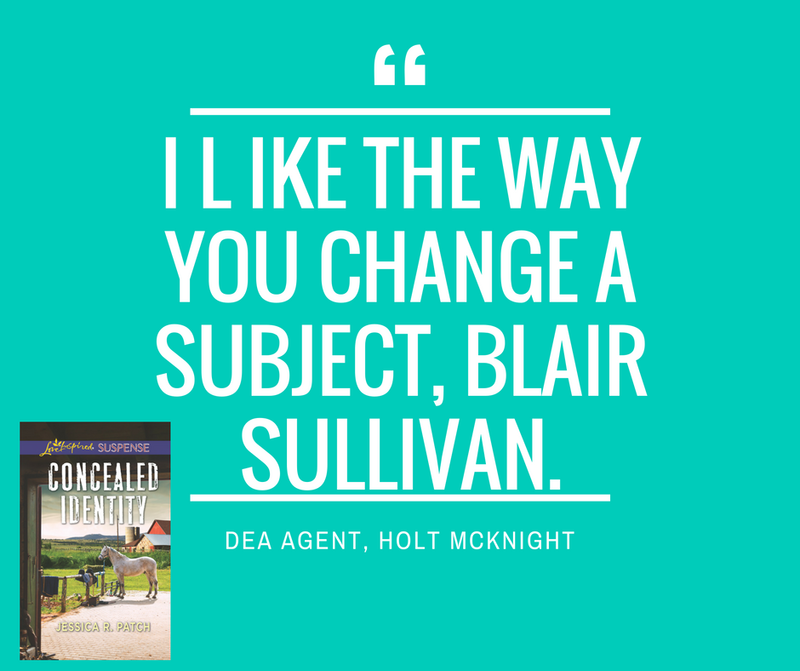 Yeah, my hero, Holt finds it weird but as he gets to know Blair and falls in love with her, he discovers it’s rather endearing. Tomorrow, you’ll have a chance to enter again (enter each day if you want!) to receive Gabrielle Meyer’s, A Family Arrangement! CLICK HERE to go to her website. Have you missed the chance to enter to win on Day 1 or Day 2? Well, here you go! Go enter! Do you have a favorite Christmas ornament? If so, share in the comments. If not, tell me your favorite Christmas song or carol! 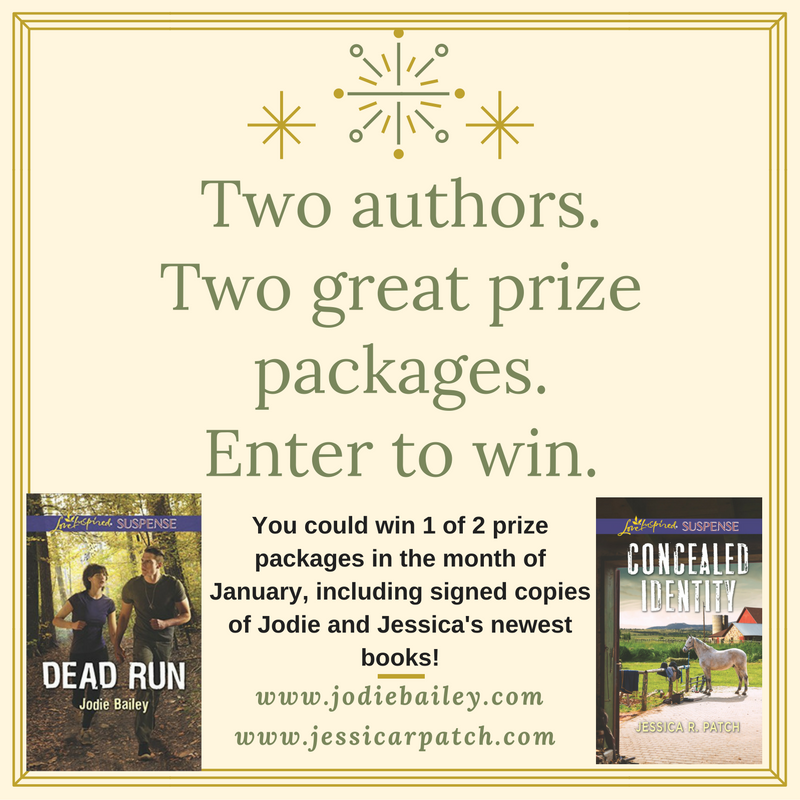 Okay, now enter to win! 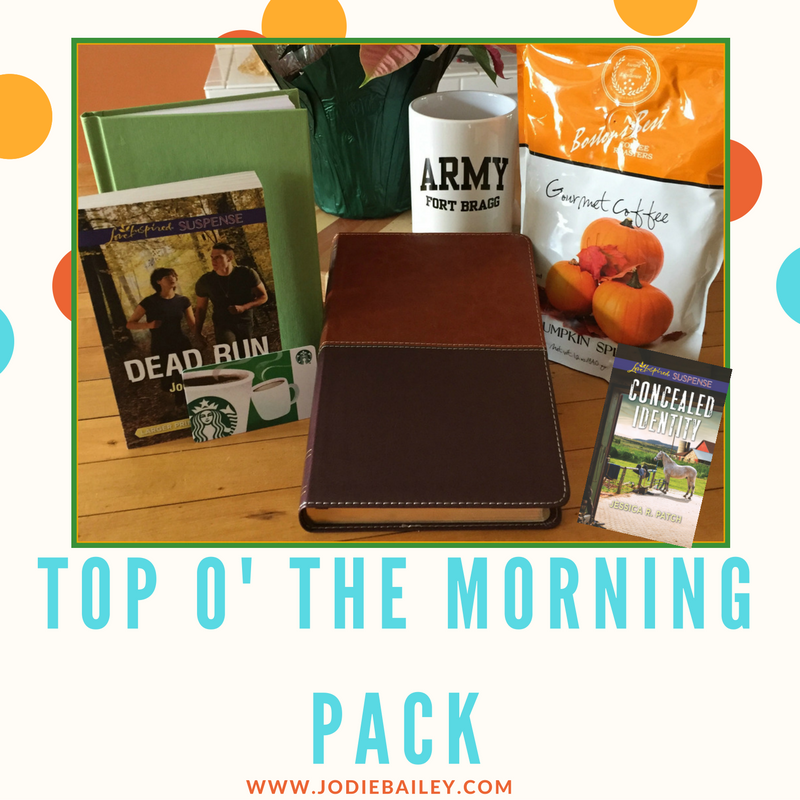 HUGE FALL SALE and a FREE BOOK! Hey everyone! It’s fall. I love fall. It puts me in such a good mood that I’m sharing the love with you! Today, November 4th through the 8th, the first three books in the Seasons of Hope series are dramatically discounted and the 4th book is releasing! 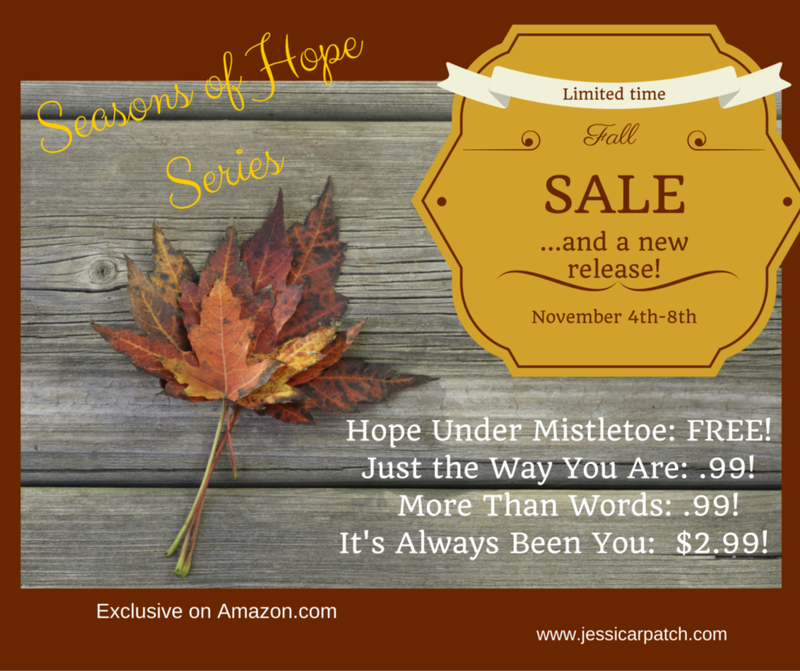 Hope Under Mistletoe (#1) is FREE and a great time to grab it since it centers around Christmas! 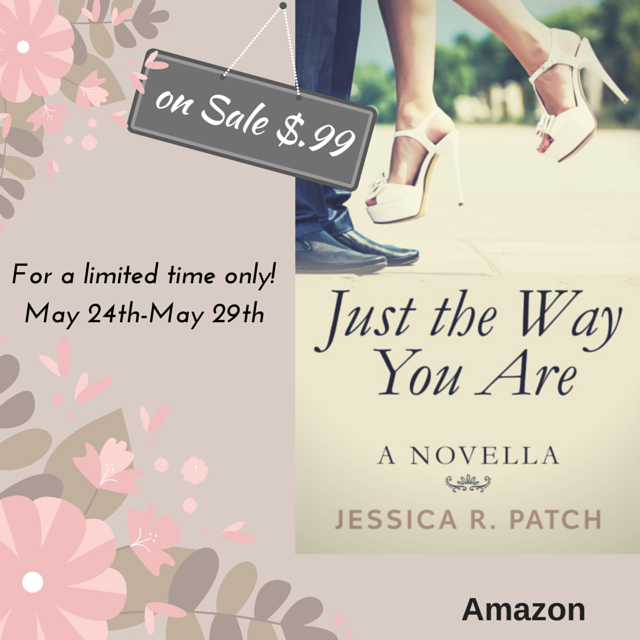 Just the Way You Are (#2) is only $.99! It’s Always Been You (#4) is the last book in this series, and just released in time to read them all over the holidays, is only $2.99. Less than coffee. In fact, you can grab them all and still afford a coffee. Happy Reading and Happy Fall, Ya’ll! Feel free to share it with friends, too. 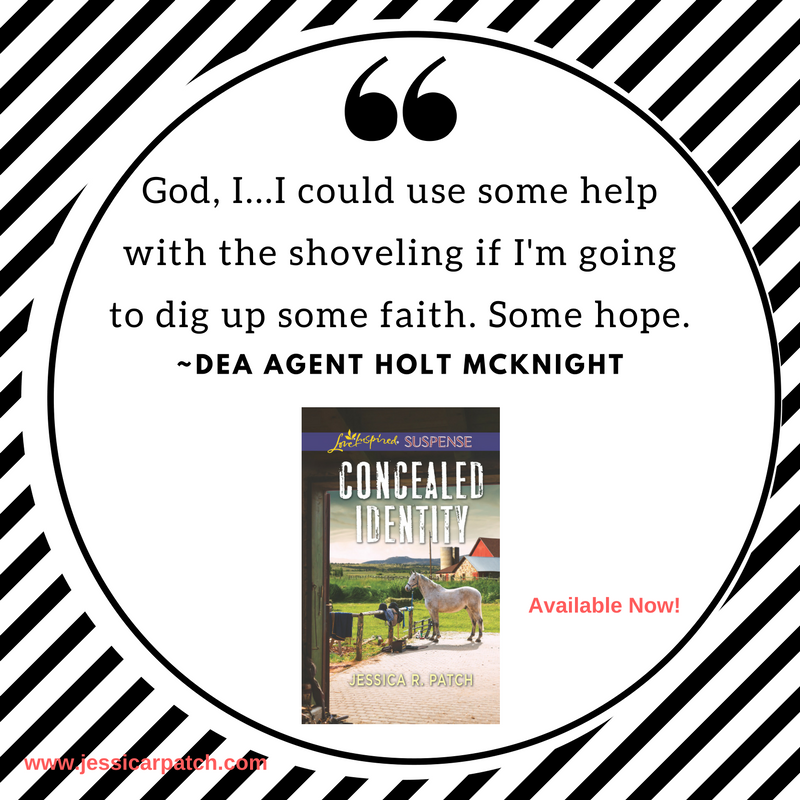 Get the Seasons of Hope Series on AMAZON! Click HERE!!!! 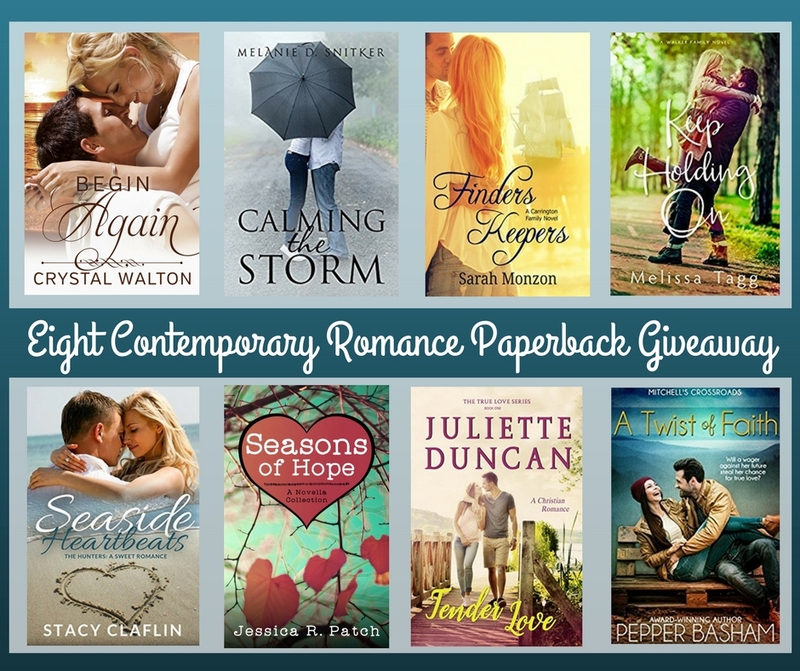 Posted in UncategorizedTagged #kindledeals, amazon deal, freebie, jessica r patch, romance, seasons of hopeLeave a Comment on HUGE FALL SALE and a FREE BOOK! Hey everyone, just wanted to let you know that Just the Way You Are is on sale through May 29th! After the 29th, it’ll go back to $2.99! Posted in UncategorizedTagged #kindledeals, amazon, fiction, just the way you are, romanceLeave a Comment on Hey Guess What?